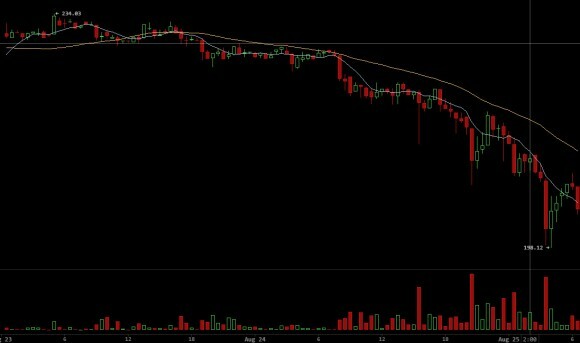 This weeks did not start well for the worldwide financial markets, and things were especially not good in USA and China as a result the exchange rates of Bitcoin and Litecoin as well as other crypto currencies are also down. The crypto currency price volatility is not something new, but the exchange rates dropping at this particular moment, especially for Litecoin, are not that good. Today LTC is expected to have its first block reward halving and the price going down to as low as $2.5 USD means that the mining profitability after the halving will be awfully low if any at all. Though later today we are probably going to see some recovery for both Bitcoin and Litecoin that will also most likely rise the fiat exchange rates for other alternative crypto currencies as well. Back on to mining LTC, we had high hopes for SFARDS to have their new generation dual-mining ASIC capable of mining simultaneously SHA-256 and Scrypt-based crypto coins such as Bitcoin and Litecoin. The more interesting parts with the SFARDS SF100 miners is their high hashrate for mining LTC only with very low power consumption, roughly 1/3 of the closest competitor in the form of Innosilicon and their A2 Terminator chips. Unfortunately SFARDS is late, they are apparently going to miss the opportunity to release the hardware before the block reward halving, so their pricing will either have to go even lower in order to get user interest if/when they have wider availability. In fact some people have apparently received first batch units from SFARDS earlier this month, very limited early availability, and the feedback was not only positive. It seems that aside from the high initial price of the miners, there is more to be desired from the build quality and in terms of reliability as well. Meanwhile it seems that Innosilicon is selling well their A2 miners as they are currently the best you can get on the market and with good price policy and availability people that want to mine for Scrypt coins such as LTC have no other choice for ASIC miners. We are going to see how things will work on for Litecoin, but meanwhile it is already experiencing a strong competition by Ethereum (ETH) in terms of market capitalization. Ethereum has been in development for quite a while, but mining has been officially launched at the end of last month along with the network starting to support transactions a few days later. The current high market capitalization of Ethereum is due to the availability of 72 million coins prior to the mining even starting, 60 million of which were sold to early investors and another 12 million to be distributed to early supporters. AS for the mining part, we have not even reached 1 million coins mined by users as we are getting close to the first month of mining. The expected rate of mining for Ethereum is about 30000 ETH a day or less than a million a month, but this does not mean that there are actually very few coins available. At the moment the daily trading volume of Ethereum is between half a million and a million coins, lately a bit lower because of the general drop in price. On the other hand Augur (upcoming application using the Ethereum network) is currently running their crowdsale and have already collected over 1 million Ether coins from users and close to 10000 BTC. So we are going to be keeping a close eye on the Ethereum development as well.